T-Mobile releases 3 new colors for BlackBerry Pearl 8120 | BlackBerry Blast! 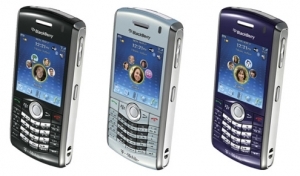 We told you a month ago that T-Mobile would be launching three new colors for the BlackBerry Pearl 8120. The time has come and the new colors are here. The new colors are "Frost", "Black Emerald," and "Indigo." Other than the color the new BlackBerrys are your standard run of the mill 8120 Pearls complete with WiFi and a 2 megapixel camera.